The Rocky Flats National Wildlife Refuge is a United States National Wildlife Refuge located approximately 16 miles (26 km) northwest of Denver, Colorado. The site was previously occupied by the Rocky Flats Plant, a nuclear weapons production facility. Rocky Flats National Wildlife Refuge is an expanse of grasslands, shrublands and wetlands, including rare xeric tallgrass prairie, where natural processes support a broad range of native wildlife. Working with others, the Refuge conserves the unique biotic communities and sustains wildlife populations at the interface of mountains and prairies on Colorado's Front Range. 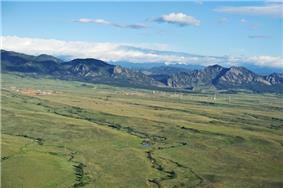 Rocky Flats National Wildlife Refuge covers over 6240 acres including these open plains. The Rocky Flats site is 6,240 acres (25.3 km2) located along the Front Range of Colorado at the intersection of Jefferson, Boulder, and Broomfield counties. The site lies on the former nuclear weapons production facility operated by the U.S. Department of Energy (DOE), the Rocky Flats Plant. Native Americans occupied the land intermittently prior to the 1800s and limited artifacts have been located from this era. Starting in 1868, the Scott family established a homestead here and the land was used to raise cattle. Later, the Lindsay family raised cattle and built a house and barn in the 1940s. In 1951, the U.S. Atomic Energy Commission acquired 2,519 acres, which included the Lindsay property, for the Rocky Flats Plant to produce nuclear and nonnuclear weapons including plutonium fission primaries for nuclear weapons. An additional 4,027 acres were acquired in 1974 for plant expansion. This 6,500-acre site was one of 13 nuclear weapons production facilities in the United States during the Cold War and was managed by the Department of Energy (DOE). The plant operated from 1952 to 1994 with manufacturing activities taking place in the center portion of the site with a large buffer zone around the area. In 1989, after the FBI-led raid for suspicion of environmental crimes at the plant, nuclear production work stopped to address environmental and safety concerns. Although work resumed in 1990, the RF mission was terminated when President George H. W. Bush canceled the W-88 Trident Warhead program in 1992. Nuclear and nonnuclear production stopped in 1993, and in 1994 the last shipment of defense-related materials was sent off-site. The facility’s mission changed from production to cleanup and closure and was renamed the Rocky Flats Environmental Technology Site. 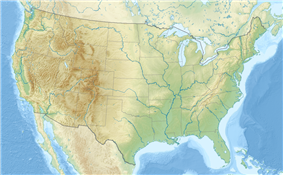 The site was added to the Environmental Protection Agency’s (EPA) National Priorities List (Superfund List) in 1989. Through the RF Act of 2001 the site was established as a national wildlife refuge while cleanup of the site was underway. With oversight from the EPA and Colorado Department of Public Health and the Environment (CDPHE), the DOE completed the $7 billion cleanup in 2005. The DOE maintains 1,300 acres as part of their legacy management for long-term care and maintenance, and to ensure the cleanup is functioning as designed. These lands are not part of the Refuge. The Refuge is one of over 560 refuges in the National Wildlife Refuge System – a network of lands set aside and managed by the U.S. Fish and Wildlife Service specifically for wildlife. The Refuge System is a living heritage, conserving wildlife and habitat for people today and for generations to come. Under the Rocky Flats National Wildlife Refuge Act of 2001 (Pub.L. 107–107, 115 Stat. 1379, enacted December 28, 2001), most of the 6,240-acre (25.3 km2) Rocky Flats site became a refuge, provided that certification from the United States Environmental Protection Agency (EPA) is obtained and which asserts that the cleanup and closure have been completed. The Comprehensive Conservation Plan (CCP) emphasizes both wildlife and habitat conservation along with moderate level of wildlife-dependent public use. In September 2015, the park opened for two guided hikes. The government-claimed remediation of contamination by actinides (chiefly plutonium-239) created over decades of nuclear weapons production, fires and at Rocky Flats remains a hotly contested issue. Charges include the claim that the U.S. Government only labeled the area as a wildlife refuge in order to cut a deal on minimizing its own cleanup costs, which were originally estimated to be $37 Billion spent over 70 years. The actual cleanup costs and time spent were only a fraction of those numbers, with below-ground contamination almost entirely left in-place. Lawsuits by downwind local residents against the Rocky Flats prime contractors over time, Dow Chemical and Rockwell International, have escalated in value to nearly $1 Billion due to a court-mandated annual interest rate. While the most recent award has been overturned on appeal, the case is expected to ultimately land in the U.S. Supreme Court. The contractors are indemnified for their liability by the U.S. Government.